Jean Carlos Piña Sará, born 1982 in Maracaibo, Venezuela. Grew up in poverty in the streets of Maracaibo. As a boy he used stones and pieces of wood to make drawings on the ground as he didn't have color pencils. By the age of 18 he escaped from the life in the streets by starting traveling. He left Venezuela and went to Brazil and all the other countries in South America. He survived by doing all kind of crafts work, in the beginning it where jewels and mandalas from iron wire. On his jurney he got into contact with local people, artisans and people from indigenous tribes, and learned their techniques, which made him later work as a silversmith. Jean also made a lot of wall paintings during his traveling for hostels and restaurants, in order to exchange for food or accommodation. In 2009 he started to work with Atelier Favela as a teacher in Capoeira, Percussion and visual Arts. He continued painting within Atelier Favela, and prefers to work with stencils. 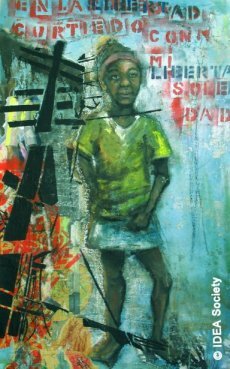 The actual themes of his paintings are influenced by the poverty of the target group of Atelier Favela, as well as his own background.